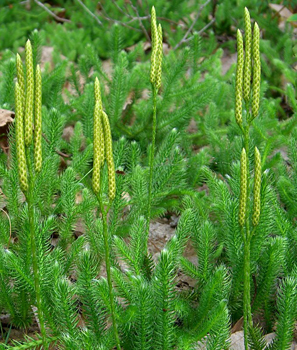 Living lycophytes are generally small plants growing in damp to wet environments or on branches of other plants. However, some extinct Lycophytes grew very tall—well over 150 feet (50 meters). Lycophytes do not have seeds; they have simple leaves and roots, vascular tissue and use spores to reproduce. Botanists recognize three major living groups within lycophytes and fossils of lycophytes are the most common plant fossils reported in Oklahoma (Lycododiales, Selaninellales, and Isoetales), plus additional groups that are now extinct. The most common fossil lycophytes in Oklahoma are included within Isoetales.